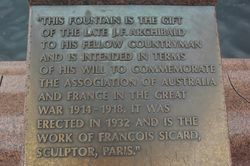 A fountain, gifted to his fellow countrymen by F.J.Archibald, commemorates the association of Australia and France in World War One. 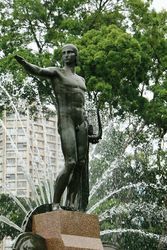 The fountain`s donor, F.J. Archibald, was for many years editor of the Bulletin magazine, and decreed in his will that the fountain should be built for this commemorative purpose. 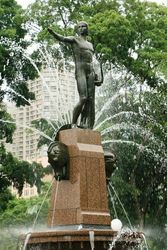 Mr. Bertram J. Waterhouse, F.R.I.B.A.A., a trustee of the Sydney art gallery, who is returning to Australia, on the mail steamer Ormonde, bought news of the Archibald memorial fountain, which is to be erected in the Botanic Gardens, Sydney, and which in Mr. Waterhouse's opinion, will be a valuable contribution to Australian art, and one of the finest fountains in the world. 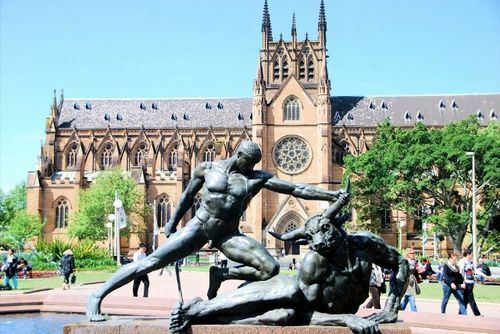 Mr. Waterhouse said that the late Mr. Archibald has set aside a certain amount of money to be expended on the erection of a memorial fountain to commemorate the association of Australian and French troops in the Great War, and had specified that the work was to be done by a French sculptor, The matter had been left in the hands of the President of the Royal Academy, London, and the choice had fallen on M. Sicard, an eminent Frenchman. M. Sicard had submitted to the London committee a model design which had been approved of. 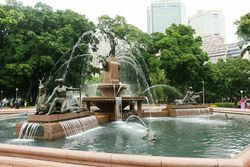 The fountain will be circular with a diameter of 60 feet. There will be three radial groups, and a central group, and the whole will be electrically, lighted. Telegraph (Brisbane), 29 June 1927.